Losing a loved one is life's most difficult reality. What better way to pay tribute to a beloved person or pet than to make a donation to help a homeless animal in their name. Giving a shelter animal a chance at the kind of life we all hope for is a wonderful way to remember those we have lost. He was a wonderful ambassador for the shelter,and loved by so many who passed through our door. He is truly missed every day. Looking for a way to honor the person who has everything? A donation in their name to the Kokomo Humane Society is the perfect way to celebrate a special occasion while also helping animals in need. BUY A PERSONALIZED BRICK ! Your brick will be placed in our front walk for all to see and remember! 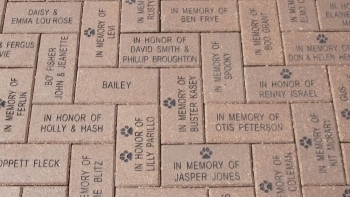 If you would like to have a personalized brick included on the Kokomo Humane Society ground, please fill out the form below and send your donation. For more information contact us at 765-452-6224.